Berwaz is a beautiful online art gallery showcasing photos, paintings, calligraphy and graphics produced by professional artists from around the globe. Customers can easily browse the gallery and pick the right piece of art for their living room or office. 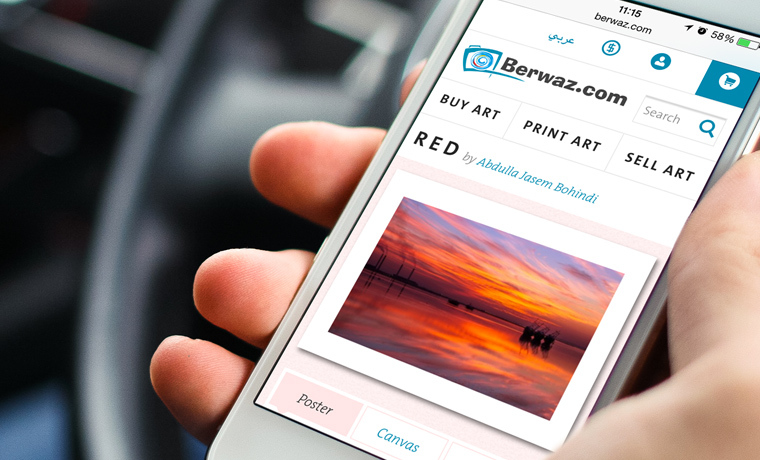 With Berwaz, customers are also able to upload their own artworks or special moments captured on their cameras, and get them printed on the highest quality materials to hang them on their walls or store in their photo albums. We created a modern mobile-first responsive website with the native feel on smartphones, working across a wide variety of platforms and browsers. This website proves that, if executed the right way, responsive websites perform better than websites with separate layouts prepared for different devices. Cloud storage and processing allows access to storage at any time and turning off some of the default Magento features made the platform as light as possible. Unique slider on the homepage shows that we are on a site that strongly values beautiful art creations. Pastel colours pervade clean and simple design in order to provide a wonderful user experience. In addition, the site is not cluttered and you know exactly where you are at all times. Berwaz is a mobile-first responsive site that performs like a charm, despite being a resource intensive site (because it’s image oriented). Its strength lies in the uniqueness of the marketplace, strong copyright protection and an image editor that keeps artwork in the highest quality that artists and their customers deserve. Design lightness and organized galleries follow the idea of beautiful art creations store.